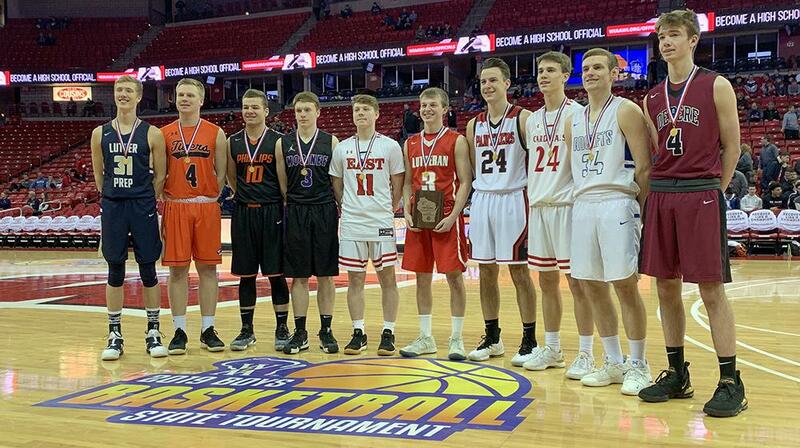 Junior Trey Zastrow of Manitowoc Lutheran won the 2019 WIAA Boys 3-Point Challenge at the Kohl Center in Madison on Saturday morning. 10 participants were selected for the event based on stats information entered by coaches into the WisSports.net database. The top two three-point shooters (minimum 75 attempts) from each division were chosen to participate. Zastrow scored 19 points in the opening round, 22 in the semi-finals, and 17 in the finals, when he finished in a tie with Austin Edwards of Phillips. In a one-rack tiebreaker, Zastrow scored five points to Edwards' four. Experience paid off for Zastrow, who made it to the semi-finals of the Three-Point Challenge last season, when he set a contest record with 27 points in the opening round. Hunter Auchtung of Ripon and Micah Kieselhorst were also in the semi-finals. Other competitors included Will Dehn of De Pere, Adam Willoughby of Stevens Point, Casey Kowalski of Mosinee, Ryan LaCerte of Wausau East, Nick Higley of Eleva-Strum, and Jake Roberts of Randolph. Full results of the 3-Point Challenge can be found below.